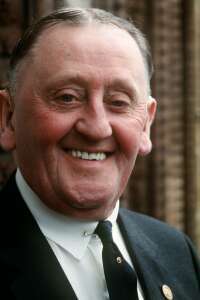 The sports editor of the Burnley Express fifty years ago was Don Smith and he was suddenly informed by manager Mr Harry Potts that he would not in future be allowed in the press box at Turf Moor. All facilities, according to the Burnley manager, had been withdrawn by the board of directors at a meeting held during the week. This was just a further sanction placed on Mr Smith and the local newspaper. Back then the local journalists would travel with the team to away games but in November 1960 that facility was withdrawn for Mr Smith meaning he would have to make his own travel arrangements and would not be allowed to stay in the same hotel as the team. No explanation had been given by the club, but the editor of the Burnley Express did receive a letter from chairman Mr R. W. Lord on 18th November. Mr Lord wrote: "At the last meeting of the board of directors of Burnley Football Club it was resolved that as and from Monday, 21st November next, your sports writer, Mr Don Smith, will have to make his own arrangements for travel and hotels when visiting away clubs in order to write match reports." When this further news was confirmed on his access to the press box, Mr Potts was asked to give a reason but would only add: "You will have to ask the chairman, but he is in London." Any attempts to contact Mr Lord had failed and Potts admitted that the chairman had told either him or secretary Mr Henry Smith to pass on the news to the newspaper. The Burnley Express did all they could to resolve the matter and, in print, left an open invitation to the club to explain their decision. They said they would be happy to print any grievance or complaint that Burnley Football Club had against Mr Smith and suggested that such a publication would be an appropriate time to lift the ban. Lord informed the newspaper that the ban was personal and would remain and no explanation would be given other than to say: "Ask Mr Smith. He knows perfectly well." Don Smith did say there had been previous threats and on those occasions it had been suggested to him that a more friendly approach in his reports and less criticism of the club would be appreciated. The ban wasn't lifted on Don Smith although he continued to report for the Burnley Express. For home games it was made clear in the report that he was reporting from the terraces. Thankfully it isn't like that today. There are times when the relationship between club and newspaper is not, shall we say, as perfect as both sides would desire. The local media don't travel with the team now, and haven't for some years, but I think the days of banning them from the press box are long gone.